Bag yourself more savings at Capitol Hill Books. Just a few weeks ago we introduced a new product at Capitol Hill Books, a book bag made from recycled plastic that is perfect for almost any errand. Now there is another incentive to buy these awesome bags: They’ll save you money! Starting now, anybody who purchases books in the store with our red book bags will get an automatic 10 percent discount good on any used books in the store. Before we get too generous, we should say that our customers can only use one discount at a time, so those with frequent shopper cards cannot combine discounts. And of course the discount is only good for those who purchase books instead of use trade credit, but other than that, there are no more catches or caveats. Buy one of our red book bags for $3.95 and get 10 percent off your used book purchases every time you bring it to Capitol Hill Books. 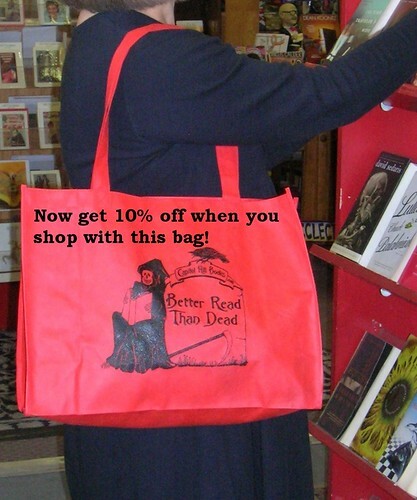 It’s our way of rewarding customers for reducing their use of plastic bags and helping spread the word of Capitol Hill Books across the land. This entry was posted in Uncategorized and tagged Better Read than Dead, Book bags, Capitol Hill Books, discounts, frugal, Savings. Bookmark the permalink. yes i believe i will buy one of one of your red bags so i can get a 10 percent discount off your book the memories of john addington symonds you have there. i plan to be there tommorrow morning at 10a to obtain it .